Server Time Protocol (STP) is a server-wide facility that is implemented in the Licensed Internal Code (LIC) of the IBM® zEnterprise Servers (zEC12, z196 and z114), System z10™ Enterprise Class (z10 EC), System z10 Business Class (z10 BC), IBM System z9® Enterprise Class (z9 EC), System z9 Business Class (z9 BC), and zSeries® z990 and z890 servers. It provides improved time synchronization in a sysplex or non-sysplex configuration. This IBM Redbooks® publication is intended for infrastructure architects and system programmers who need to understand the IBM STP functions. Readers are expected to be generally familiar with System z® technology and terminology. 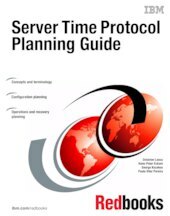 This book provides planning information for Server Time Protocol functions and associated software support. For more detailed installation, operation, and recovery information, refer to the companion books Server Time Protocol Implementation Guide, SG24-7281, and Server Time Protocol Recovery Guide, SG24-7380.